Just Romantic Suspense: Don’t be afraid to try something new! I often hear others in the industry mention their love of the written word or how they knew they wanted to write stories for as long as they can remember. In my case, neither of those statements quite rings true. I hated reading as a young girl. It wasn’t until I was twenty that I had any desire to pick up a book and read for pleasure. I also never knew I wanted to be a storyteller until five short years ago. For most of my adult life, I worked with children with moderate to severe special needs. I loved it. Then we moved to a new state and the career I had chosen turned into a nightmare. My new job was awful and I resigned after a month of coming home in tears every day. For about two weeks, I binge ate chocolate and reread my favorite Nora Roberts novels. And then an idea clicked. I decided I was going to be a writer and tell fascinating stories just like my most favorite author. My husband came home from work and I shared my new ambition. I think he thought I had lost my mind, but he supported me anyway and has continued to be my biggest champion. For weeks I sat at my computer, typing away, having no real idea of what I was doing, but I loved it and how hard could it be, anyway? For a long time, I thought I was a storytelling genius—that one person who could write down their words and would instantly be picked up for a writing contract as soon as I got my work into the right hands. Wrong! I finished my first draft and joined an online writing community where I could trade critiques with other writers. I learned so much and realized I had a long way to go to improve my craft. I rewrote my novel twice before I sent it off for professional editing. And the editor emailed me the next day to tell me not to give up my day job and refused my manuscript. For a good two weeks I went back to the chocolate and Nora books and was ready to give up, but my champion reminded me that an editor is just a human being with an opinion. Thankfully, I resubmitted my work to a new editor and he got started right away. While my editor helped me clean up my project, I got started on the next story, then the next. Within a year and a half, I had three completed novels on my hands and wavered on what I should do with them. After doing much research, I decided I could spend months writing query letters or I could put my work out there on Amazon and the several other vendors available to indie authors and see what was what. This was the right decision for me. One nail-biting weekend in October 2012, we made all three books—Morgan’s Hunter, Falling For Sarah, and Hailey’s Truth—live and by weekend’s end, they were climbing Amazon’s ranks and made the bestseller list. Now, here I am less than three years later and I’ve begun work on my eleventh novel. 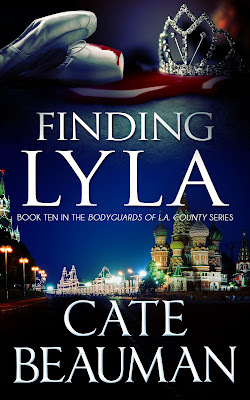 I wake up every day thanking my lucky stars that my new job in a new state had been truly wretched, that I had the courage to try something different, and that I have loyal readers that eagerly come back for each new adventure in the Bodyguards of L.A. County series. With lots of hard work and a healthy dose of divinity thrown in, I’ve managed to become an international best seller, the runner up and winner of several very cool awards, and the writer of well-rated novels. Long story short: never be afraid to learn, go after what you want, grow from rejection, and be thankful every single minute for your tragedies and triumphs. Very interesting to hear how she go started! So happy you took the chance..love this series! I am so glad that your day job was terrible and you decided to be an author. This series is such a joy to read. I love Cate's books! So far the ones I've read have all been out of order and they're fabulous! Can't wait to read this one too! !